A long time ago, in a pool in Port Orange Florida, I came up with a story based on a Raleigh, North Carolina art museum. 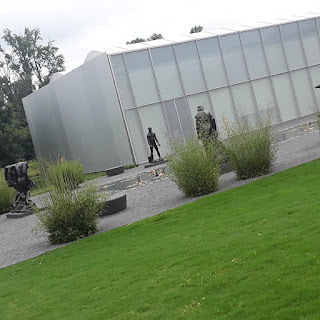 My sisters regaled me with stories of the newly opened wing at the North Carolina Museum of Art that included around thirty bronze sculptures by the French master, Auguste Rodin. As an Art major, who has visited numerous museums, I had my paranormal story half written before I ever discovered the Rodin Garden on the museum's one hundred and sixty four acres. 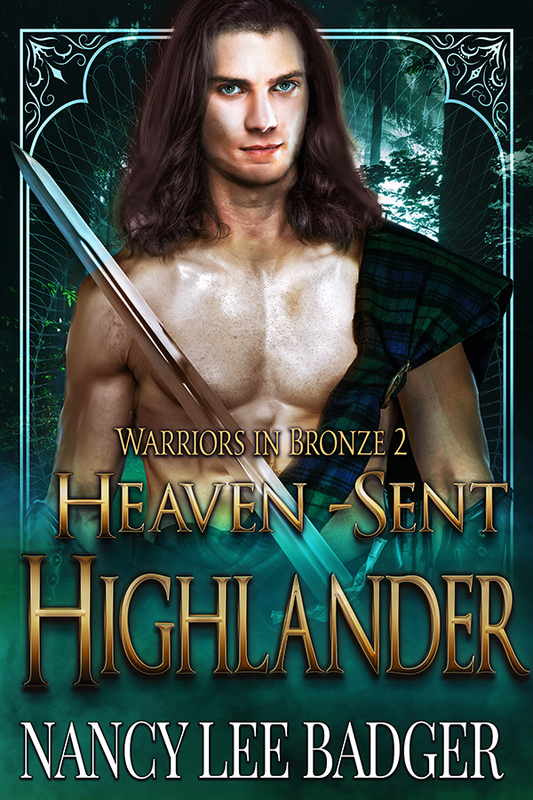 The first book in my Warriors in Bronze series, Heaven-sent Warrior, was released last July. Heaven-sent Highlander was released TODAY and I am thrilled. Another day passed with Henrí sharing his knowledge about the abilities Rodin had instilled in him which included conjuring, blinking, and healing. “No one spoke odd words to you before you found yourself inside the statue?” Henrí asked. “What?” Although surprised, he knew Henrí spoke true. Who would have such power except someone from Heaven? I took lots of photos of the beautiful works of art at the museum (which I refer to as the Raleigh Museum of Art, in my book) and will soon add videos of my excursions through the halls and around the grounds of the museum. The book is available in ebook at these fine locations. L.D. 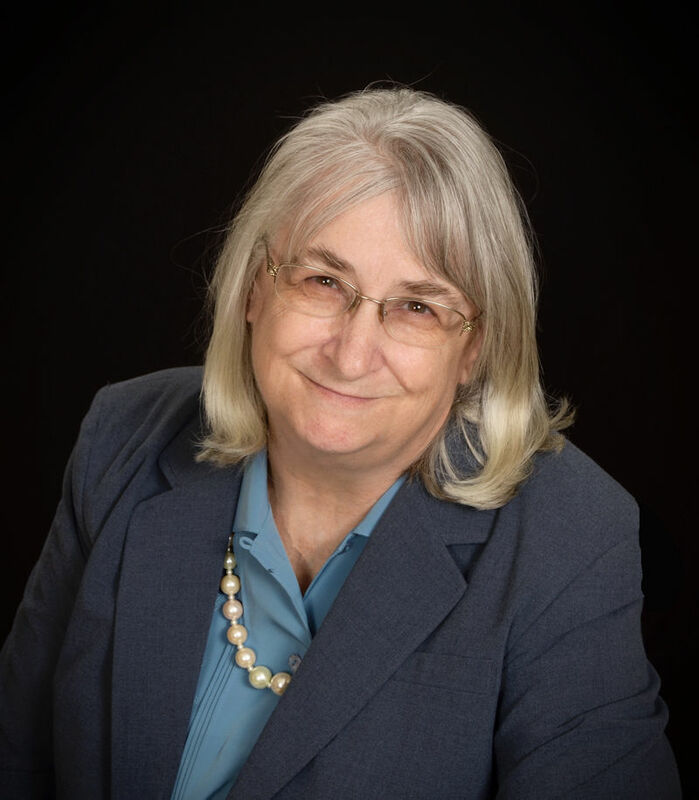 Rose calls herself a neurotic physician by day, crazed writer by night, and all around wannabe superhero, but I know her as an author who has also published books with Soul Mate Publishing. 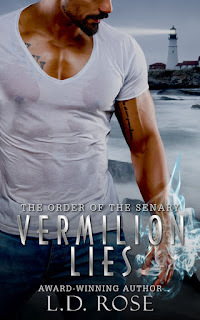 I invited her to my blog to share her latest release, VERMILION LIES. Take it away, L. D. Rose! Hi everyone! Thanks for having me on your blog, Nancy! My name is Linda (w/a L.D. Rose), doctor by day, writer of dark paranormal romance and urban fantasy by night. I LOVE to write about vampires! Dark, terrifying and brutal leeches, as they should be. ;) But the real stars of my dystopian paranormal romance series, The Order of the Senary, are genetically engineered mercenaries (hybrids! ), who are half-vampire, half-human and they’re assigned to protect humanity from the leeches. Each of these fellas have a “superpower” and they’re so much fun to write! They work hard, play hard, and love harder. :) My latest release is the third book in my Order of The Senary series, VERMILION LIES is now available on Amazon. Hope you check them out! April is National Poetry Month so I am glad a local Raleigh-area poet, and fellow member of the Triangle Association of Freelancers, stopped by to share her latest work. Take it away, Lisa! 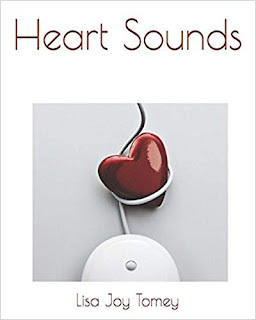 Nancy, I appreciate your taking the time to share about my book Heart Sounds, a chap book of poetry. This is my first book of poetry. Much of my work has been as a ghostwriter, but my first language is poetry. This book has been in my heart for several years. It came to life when I reviewed my collection of poetry, which spanned for years, and selected the poems which fit into the theme. Heart Sounds is a Chap Book of poems about love in many forms. The focus of Heart Sounds is love in four areas: Family Love, Love of Friends, Love Sounds, and Self Love. While this book is not all-inclusive of the various forms of love, it is a sampling from the heart and more work is in the works. *Note from Nancy- This is only one example of the many wonderful poems Lisa has included in her book Heart Sounds. Lisa Tomey has been writing ever since she took to the pencil, really getting a true taste at the age of 11 when she was inspired by her 6th grade teacher to keep participating in Creative Writing classes. Her class participated in an anthology of poetry and shared poetry in the various forms they had been studying. I just returned from spending 6 weeks in Florida. Dad passed away February 2nd and Mom was ill. She is much better, and I am back in Raleigh, NC with dear hubby and my muse, Blaze. I kept writing while I was away...with my laptop on my lap while sitting in the hospital, or when Mom napped. Edits for Heaven-sent Highlander are complete and the book comes out in less than a month. An outline and the first 10 chapters of my next book, Heaven-sent Flame, are complete and I will stay busy the next few months creating adventures for my characters. I came up with several plot ideas and a bunch of scenarios, so I will get back to my writing. Thanks for following me! I invited author Helen Henderson to share her brand new book Tell us all about it, Helen! Nancy, thanks for letting me stop by. 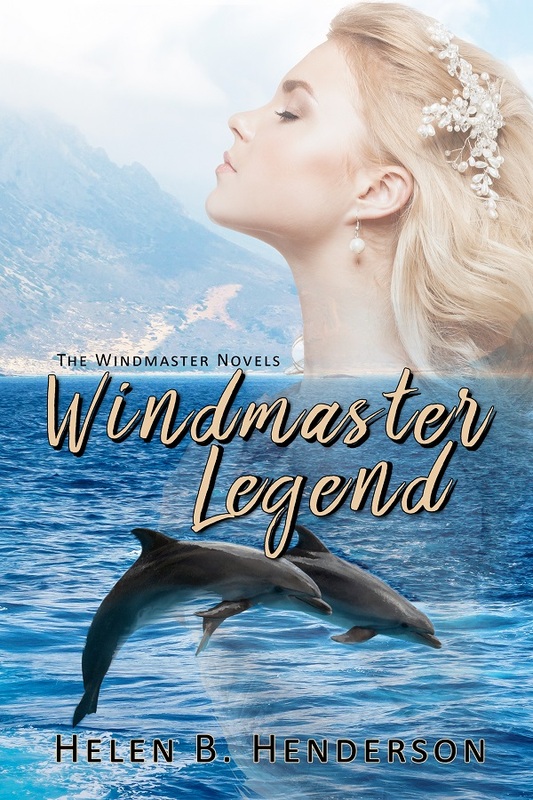 My March 2019 release, WINDMASTER LEGEND is a fantasy romance. What history and time may conceal sometimes refuses to stay lost in memory. Windmaster Legend reveals the story behind the legend of the star-crossed lovers, Iol of the House of Cszabo and Pelra of the House of Pirri. Their legend first appeared in Windmaster, Book One of the romance fantasy series, the Windmaster Novels published by BWL Publishing. WINDMASTER LEGEND can be read as a stand-alone and is available in ebook and paperback formats. Moonbeams danced on blond curls surrounding a bent head. The woman lifted her head and tightened her grasp on the instrument cases across her lap. The sight of her red lips excited Leod. There were few female bards, but he had heard whispers of their ability to satiate a man. Finally, a prize worthy of the chase. Loud strumming from the courtyard warned the current tune was about to end. If he wanted to get closer, he had to move before the music ended. But what of the servant? Worry hissed. Warmth at the memory of the satisfaction in the other man’s expression rose up Leod’s neck. He stared at the woman who once again contemplated the skies overhead. Had he lost the prize before the chase even begun? “No, that is unacceptable,” he breathed. “I’ll find out who that servant was and destroy him. And if the bard graced him with her favors, then she will be next.” Again, he evaluated the features now cast in moonlight. But until then, she’ll provide a distraction not even council members enjoy. Surprise stopped his hand in mid-gesture of offering her the glass of wine. The “come hither” smile that normally resulted from his introduction was missing. Instead, there was just silence and a raised eyebrow. He’d heard the bards could strip a man to the bone with a glance or single word. But he’d never believed it. Until now. Erika Hoffman is a fellow member of the Triangle Association of Freelancers, here in Raleigh, North Carolina, and I invited her to share her latest novel with y'all. Thanks for having me, Nancy Lee. Why Mama is a mystery novel released February 27th by Library Partners Press. Day of Murder Saturday, 3:35 p.m. I banged on Fancy’s backdoor. No answer. Dang! 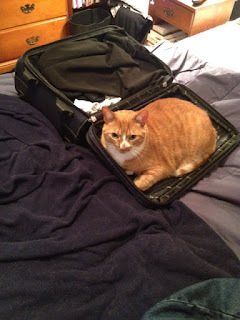 Had she gone to the pool without me? “Fancy? Fancy?” I yelled through the screen door while vulture-like flies buzzed around me. I heard the TV droning inside. A dog barked somewhere inside the Fulcher house, behind a closed door, muted. I pounded the door. I edged the door slightly open. Was that a moan? I opened the door and saw the Corningware dish on the floor, its contents, uncooked—spiraled in all directions and the oven on. I took a deep breath. The mixer was out. A bag of pecans, a bottle of Karo syrup, and a stick of butter, melting, rested on the counter. Fancy often carried her mom’s famed pecan pie to Girl Scout pot lucks or youth group get-togethers. Was Mrs. Fulcher about to make one? “Hello!” I hollered into the kitchen. I listened for a response and heard Buster whining from inside the house, somewhere. As I stepped over the mess and proceeded to the den, I heard a loud exhale. In the faux leather Lazy Boy slumped over was Fancy’s dad. Blood dripped from his head onto his shirt. Sprawled out nearby was Mrs. Fulcher with a gun barely touching her fingertips. I froze. I knew I should check for a pulse, prop up her head, clear the airway, talk to her, but I forgot all the lessons I’d learned for a merit badge and stood inert—unable to budge. My eyes widened as I spied the phone on the knick-knack strewn end table near the Lazy Boy; I reached across him for it. When I did, Mr. Fulcher’s chair fell backwards, and I tumbled onto his lap, looking upward into his glazed-over eyes. I screamed a scream which ten minutes earlier I wouldn’t have thought my voice box capable of. How much time passed before I dialed 911, I wasn’t sure. “Calm down. Who is this?” the operator asked. Before I replied, a door squeaked open, footsteps echoed through the kitchen, and there in the doorway to the den stood my friend, wide-eyed, wild-eyed, dripping wet and petrified. 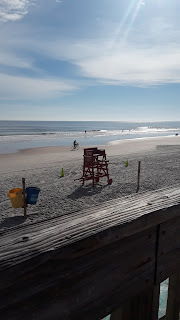 Mostly, Erika pens inspirational, non-fiction essays that appear in anthologies such as Chicken Soup for the Soul or in regional magazines like Sasee of Myrtle Beach. 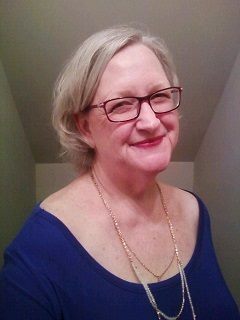 She’s had her advice on writing humor published in The Writer in addition to her essays on the craft published in the online Funds for Writers Magazine and on thewritersdigest website. Monthly, she composes a column on the subject of writing for a section called The Writers’ Table in the ezine Page & Spine. A compilation of these essays and others form her book called Erika’s Take on Writing. Also, she teaches a course for Olli at Duke University on composing the personal essay. Although her niche frequently is the non-fiction narrative, she’s crafted fictional stories, featured in Deadly Ink Anthologies, Tough Lit. Magazines, and Page & Spine. 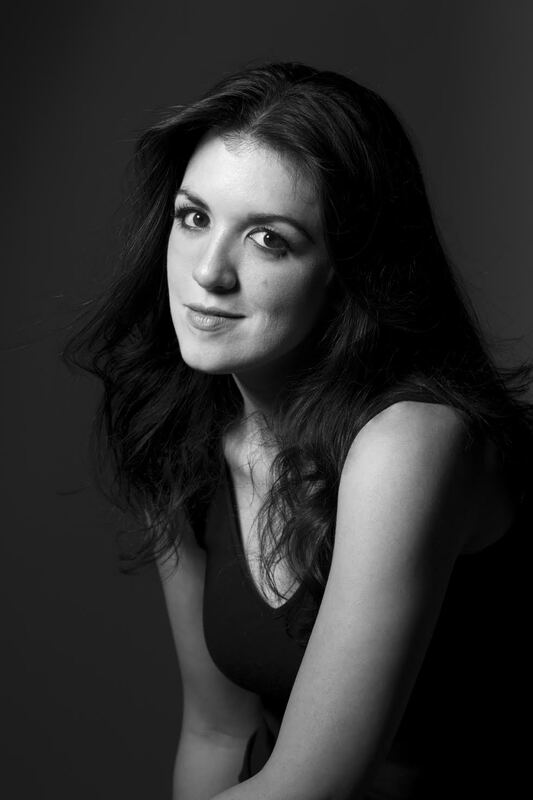 A book of her published essays on travel will be completed this year: Erika’s Take on Travel. Besides her other writing projects, she’s planning on more mysteries being a part of her future! Erika taught public high school for ten years and raised four children. Her degrees are from Duke University. She resides with her husband in Chapel Hill, North Carolina. I invited author Nancy Holland to stop by and share her latest book release with my readers. Take it away, Nancy! Thanks! 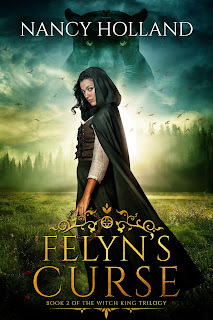 Felyn’s Curse, book two of the Witch King trilogy, will be released March 5 by Tule Publishing. 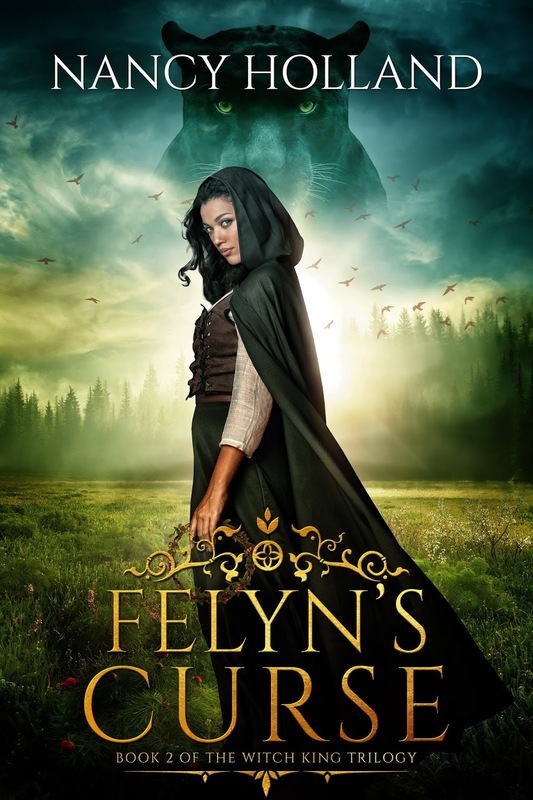 Felyn woke to the cheerful sounds of a camp on the move toward home. She stretched and sat up just as Varz came into the tent with two bowls of warm breakfast gruel. Suddenly hungry, she stood and took one, then settled, a little awkwardly, on the ornate chair next to the one Varz sat in. “How can I help prepare for the journey?” she asked to break the silence. “You can’t. You must stay in the tent,” he said casually. “I am a very indulgent man, under the proper conditions,” he said with a look she could not read. “Which do not apply here,” she reminded him primly. He sighed and stood, taking their empty bowls. “Sleep, woman,” he told her, not unkindly. And, strangely, she did sleep. Perhaps because she had slept so little the night she went into the woods. By noon the light was so strong, even in the tent, that she could sleep no more. With a yawn, she dressed, threw all the pillows in a single pile, then went in search of Varz and food. But when she stepped from the tent, she found half the circle gone, people, tents and oxen. She was alone with Varz and his warriors. She nearly collapsed from the shock and grief, but rage won out in the end. She found both Varz and food where he ate a lunch of mutton stew by the cooking fire. She took the bowl the cook gave her and threw it at her new man, hitting him square in the chest. I met M. E. Henderson here in Raleigh, North Carolina at a TAF meeting. Marvis and I attended these once a month dinner-optional-but-we-love-to-eat meetings of an organization we both enjoy. The Triangle Association of Freelancers helped me in many ways, and I invited Marvis to share her new book with my readers. Take it away, M. E.! Nine Lives is my debut novel, writing as M. E. Henderson. This self-published novel was released on Kindle version in October 2018 and the Paperback in November 2018. The story is about the reasons behind a college football player’s decision to stay his senior year or enter the NFL draft after his junior year. His mother understood that football was big business in college and professional sports. Her goal was to keep him grounded. “For those that do not know, college football is big business. I am Hunter Eugene Terry, Jr. and I have something that big business wants: Me!” The NFL wanted him too! Should he enter the NFL draft or stay for his senior year of college? If only that decision was the usual football player’s dream of fame. He was different. His near-death experiences and his loved ones dying around him weighed deeply on his mind as he contemplated what to do about his future. In the meantime, while his mother wanted him to finish his senior year in college, his uncle was already counting Hunter’s future earnings. Whom could he trust with his football career on the line? “You had no right!” I screamed on the phone. “Calm down, Sis,” Michael replied. Elizabeth hit the End Call button on her phone. She was too angry to sit, so she stalked around her bedroom. Her mind was racing, “Should I call Hunter? No, I promised myself I would not interfere. I promised not to interfere. Well, that was before everyone started to interfere. I told Hunter it was his choice. I told him I would support whatever decision he makes. “Lord, please do not let the phone screen be cracked. That is the last thing I need to happen.” She almost cheered when she retrieved the phone from under the bed. Thankfully it was not cracked. She went to the chair and took a deep breath. Elizabeth knew what she had to do. She dropped to her knees and began to pray. The Lord had heard her cries before. Hunter had been through so much in the last four years. She prayed for the Lord to give her son the discernment to do the right thing. Marvis’ college degrees did not prepare me for the biggest challenges of my life. In 2002, she was diagnosed with Fibromyalgia. It robbed her of the life she planned. 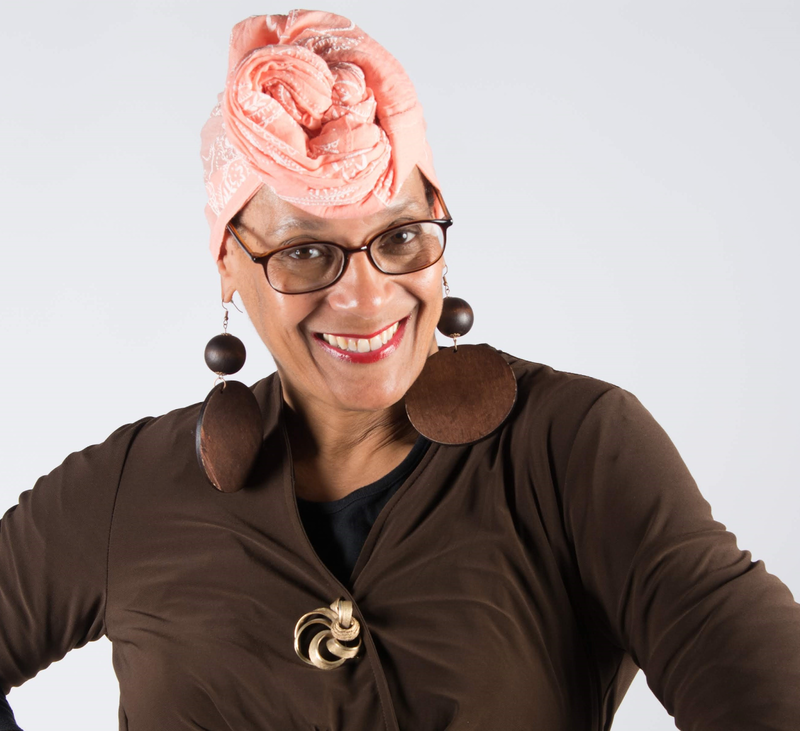 Before she became disabled, she served as a branch manager of Employment Security Commission and served in several leadership roles in her community and church. Because of the change in lifestyle, she is living dreams and creating new opportunities. One of those dreams was writing. 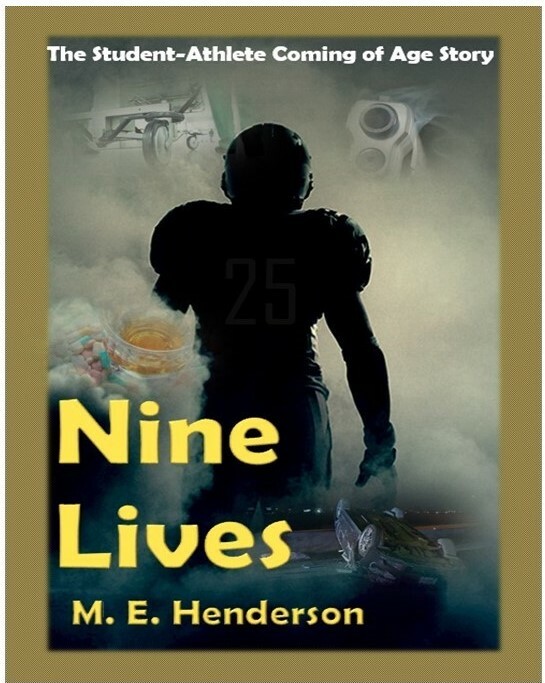 She published her first novel, Nine Lives in 2018. She created new opportunities as the Coordinator of Fun and CEO of M. E. Henderson, Inc. She uses urban line dance to throw parties, participate in health awareness activities, and teach classes at Covenant Presbyterian, Holton Career, and Creedmoor Elementary. She also speaks to audiences about creating positive lifestyles for people with chronic illnesses. She is also the founder and Vice-Chairperson of Lift Every Voice Institute, a 501©3 organization that provides academic and social enrichment opportunities to students and their families. In 2018, she received the ACHI Public Service Award. In addition, while her son graduated from college in May 2018, she started working toward another dream and became a doctoral student in April 2018.